Wall art can be more than some images placed on the walls. It is the expression of style, personality and overall class of a person’s character. Even though it is displayed on the walls it can also change the entire atmosphere and ambience of the space. Sometimes with so many ideas going on within the space the wall art can become hidden and, what you will want to accomplish with the set-up of the wall art is a focal point. Here are some tips to help you with the process. If you prefer to have a specific designated area for your wall art to be displayed so it won’t seem so over the place then an accent wall will be perfect for you. Begin by picking out one wall, that could be located in the hallway, living room, dining room etc., that you would like to be a good place holder for the wall art, then arrange them like that of a gallery. That way, by having chosen area it will be able to stand out against the other pieces within the space, without feeling overwhelmed or hidden. Or perhaps you would like for your wall art to set the scene and literally be the backdrop of the space. If that is the case then use subtle artwork that is colorful and/or scenic to act as the modest settings for the space. This tip can also be used to distract from some unattractive architectural features within your home such as gawky long wall or just to simply enhance the attractive architectural features such as a long hallway. Since the placement and position of both artwork and furniture are so dynamic within the space have them work together, instead setting one to work around the other. Decide on what the space will be used for; dining, family time, kid’s area, etc. then bring in the furniture and artwork combination. Once the space has a purpose you will be better able to design it with the eminence you desire. 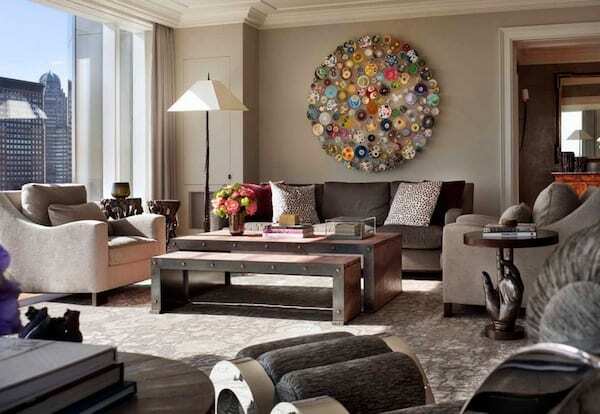 Having wall art displayed and set as the focal point in your home shouldn’t be complicated, but exciting and enjoyable. Being able to select the perfect artwork to design your interiors is great stimulation for you, your family and guests. The more you invest into designing or decoration your home the more personalized and pleasant it will become. So take the tips above and create a focal point with your wall art and see how a new focus to your room will become evident.